Oooh, that sunshiney thing was out once again. I'm getting rather used to it now, I hope it chooses to stay a while (I'm putting fingers in my ears when the weather forecast is on TV). Living where we do, surrounded by countryside and farmland, I like to be out on the land as much as possible. I love being around the chickens and watching their antics, playing alongside the goat kids which never cease to entertain, and watching Taisia run around in true wild child style - complete with mass of curly blonde locks that never stay tidy. I always know she is going to sleep well after a day outside 'working'. 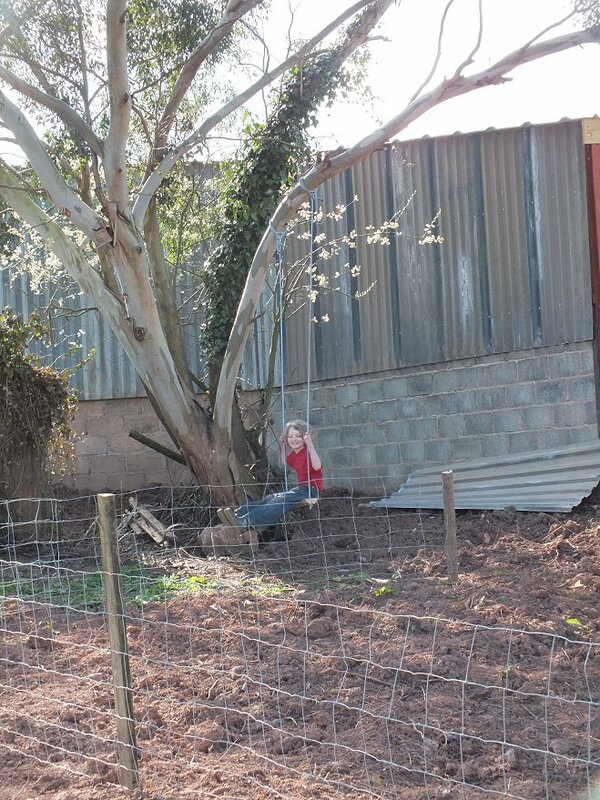 Today's lessons in life included how to make a swing, clearing out the stable for the goats and building a 'table' for their bed (although our goat kids like to sleep underneath), putting the ducklings outside in a house and run after making it non-accessible to vermin and other predatory creatures, and supervising chickens (watching their body language and trying to read what their next action would be). In between all of these activities, cakes and curry were made, more seeds were planted, plants were watered (shoots are appearing daily, the children are loving them sprouting so quickly), books were read, rooms were tidied, discussions were had and plans for the future were made. 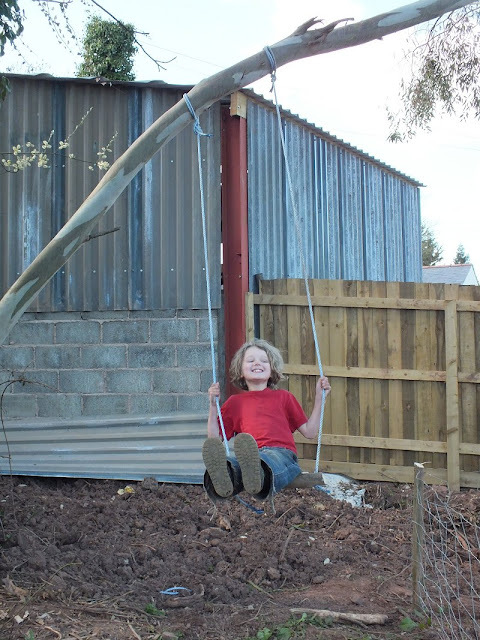 Making the most of what nature provides for us, the best play equipment ever. I have really great news to report regarding the chickens. Well, I think it's rather grand news and any fellow chicken keepers out there - or anybody that has had to introduce any animal to another actually - will understand my need to have a record of the news. My now 6 girlies are getting on rather grand. There is of course still the little bit of 'hen pecking' going on, but nothing violent or concerning. The newbies are not standing their ground thank goodness and are happy to just wander off when they see one of the others approaching rather keenly. That doesn't happen very often now and although the two groups tend to stick with each other and not infiltrate one another, there have been a few occasions when they have mixed together with no issues. All positive signs that intros are going well. When I went to lock up tonight I was so pleased to witness all six chickens hunching up together on the same perch. Last night we went through the separation procedure again as poor Lulu couldn't get on the perch she wanted because it was being guarded by the naughty Babs. She literally patrolled up and down the perch and 'fake' pecked Lulu's head each time she dared look up. Lulu looked most distressed - well, as distressed as any cuckoo maran can look. We popped the three newbies in the other section and kept them apart for the night. Tonight though all were mingling and looking content, in mixed groups too which is great to see. There may be a chance that we will be receiving another goat on Sunday. This time an adult, a lovely gal called Poppy, currently in kid so will need extra special pampering and care. We have thoroughly cleaned out the stable today (should have taken before and after pictures!) A 'table' bed was created and we have let the little ones make use of it for now. It will be great if they all get along well and they can reside together straight away but we do have a separate pen for the little ones to use if not. We shall just see how the new lady takes to her new family and surroundings and play it by ear. The three ducklings are still providing great entertainment. As the temperature has risen ever so slightly we have now placed them in an outside run and house. We will let them have free-range when we are around to supervise very closely - being very aware that they are a predators dream at the moment as they are pretty much indefensible. The children know to be on their guard at all times when watching them, particularly watching for swooping feathered creatures coming from above. We have a fair few birds of prey in this area and have to be aware that young ducklings would be high on the list of possible meal ideas. The ducklings have been tucked up in the house for the night after we ensured it had been reinforced 'just in case'. I'm such a paranoid animal mama. I do try to cover every eventuality and then at least I know that I did all I could to protect them and provide them with the best of care for their days residing with us. As it is now after 2am, I shall turn this machine off and say goodnight. I will leave you with these beautiful flowers that a rather special lady sent to me after hearing what had gone on in Facebook land. 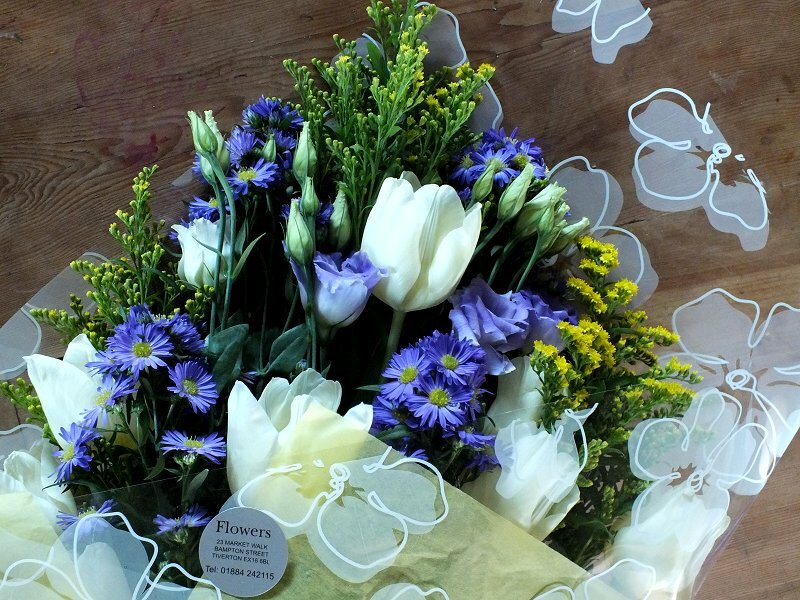 It is the first time that I have received flowers via delivery at my door, heck, it is the first time I have received flowers from a proper florists. I was truly delighted to receive them and they are taking pride of place to remind me of the good friendships I am fortunate to have forged. Keep on smiling those beautiful smiles! Beautiful pics, love the swing and those flowers quite rightly so lifted your spirits. i'd wondered where you'd gone on FB, must admit i only use it to post encouraging comments to friends, my status is permanently zero, bit like life at times!! Something else to make you smile, I'm now a grandma!!! Not bad for 45! Kath our firstborn and younger twin gave birth to Mary Grace on 11th April, if you want a sneak peek feel free to hop over to the blog! May you continue to have happy days. Lovely update, awesome swing! Your updates keep me smiling :) Thank you. Another inspiring post again Julia. Thank you. It is so true, nature really is the best playground for children and your kids have a great playground! Looking forward to your next post.